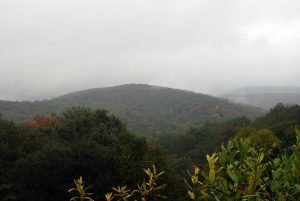 The Laurel Fork South Wilderness is in the high-elevation lands of West Virginia and is part of the Monongahela National Forest. The wilderness area runs along the Cheat River’s Laurel Fork and borders Middle Mountain on its western border. This wilderness area sits across Randolph County Route 40 from Laurel Fork North Wilderness. This wilderness area contains nine miles of hiking trails. The area was designated wilderness in 1983 and consists of almost 6,000 acres. The Laurel Fork is home to wild turkeys, white-tailed deer, beavers, and bobcats. There are also black bear, although they are rarely spotted and there are a multitude of bird species. There are also brooks and creeks containing native brown trout and brook trout, but it is hard to cast because of the heavy underbrush. There is a narrow valley created by the Cheat River and many long, slim ridges and steep slopes. Rich Mountain borders the area on the east and Middle Mountain on the west. The forest is dominated by maple, beech, birch, black cherry, and yellow poplar. Meadows are found along the Laurel Fork. Winters can bring heavy snow, but most of the summer, temperatures are very pleasant. You do not get cell phone reception so you will not be able to access the internet to look at websites. Two popular hiking trails are five miles each and follow the river starting at the central trailhead located at Laurel Fork Campground. From Forest Service Road 14, one trail heads north into the wilderness and three trails head south. There are no trails in the eastern part of the wilderness. This wilderness area is not heavily visited, so a solitary hike is possible. The hike along the Laurel Fork is pretty flat and is a nice riverside hike. There are no loops in the trails unless the road is used. This wilderness area is a pristine area with gorgeous views throughout. There are campgrounds available during the season.